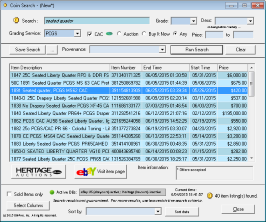 CoinRIFLE® | Numismatic Auction Advantage software (NAA) beta home - © 2015 DB-Pros, Inc.
For buyers and sellers of rare coins online at Auction sites like eBay, Heritage Auctions, Stack's Bowers, GreatCollections etc. Gain the CoinRifle® NUMISMATIC AUCTION ADVANTAGE (NAA) today! The BEST Live Price Research for coins available !!! 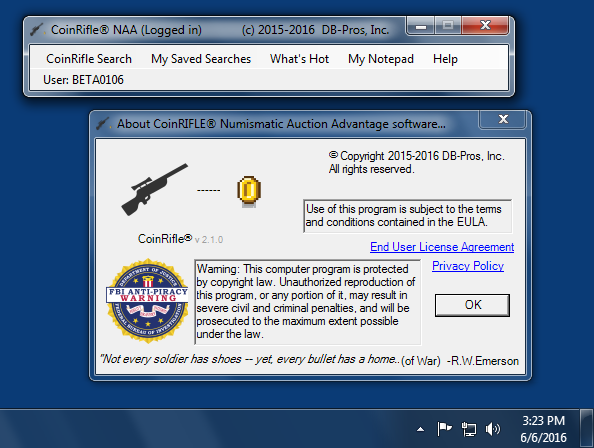 Find your next GREAT coin with CoinRifle® coin auction hunting software ! *CoinRifle® pays for itself with one coin purchase ! All IP and works are (c) 2015-2017 - DB-Pros, Inc. | All rights are reserved.